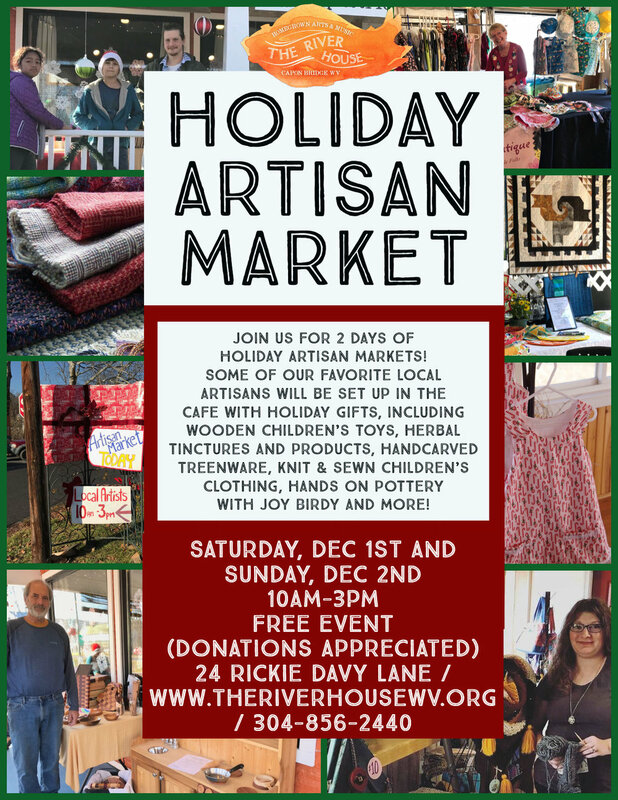 Join us for a Holiday Artisan Market! It will be held inside our Cafe on Saturday December 1st & Sunday December 2nd from 10am-3pm. Some of our favorite local artisans will be set up in the cafe with holiday gifts, including wooden children's toys, herbal tinctures and products, handcarved treenware, knit & sewn children's clothing, hands on pottery with Joy Birdy and more! Come get your hands in local clay with Joy Bridy. Joy will be bringing a well-seasoned batch of local clay for our use this weekend, ready for your hands and hearts. While we visit the river at the River House, we'll sit and talk, breathe, relax, make a pot, tell stories, and when we're good and ready, we'll leave our pots full of leaves and stories to go back into the ground, or float them down the river, or take them home to watch them change in our gardens and yards....it's up to you. All ages and all abilities welcome, of course.